Last night, the Lafayette City Council met to consider putting an amendment into the Lafayette Human Relations Ordinance. Some time ago, the city codified a “Human Relations Ordinance” to fight against discrimination in our town. 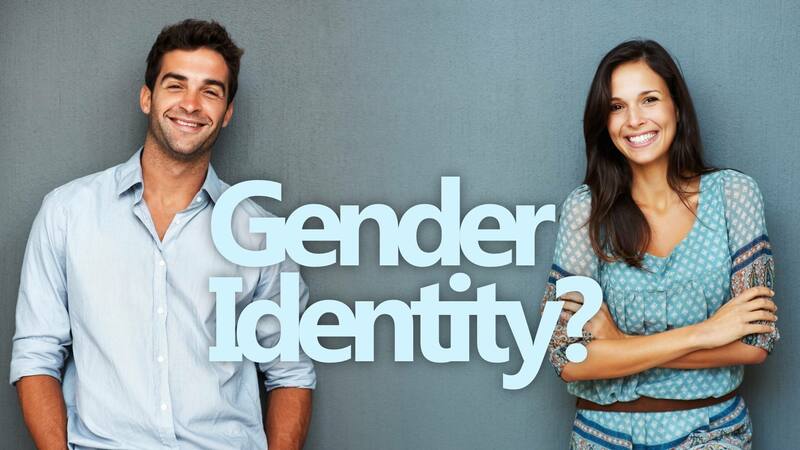 It created a Human Relations Commission tasked with the job of investigating cases of discrimination in our city and offering suggestions and education to individuals and businesses found to be discriminatory. In a recent conversation I had with a church planting friend of mine, the topic of the tithe came up, and I thought it might be interesting for me to put down in this forum what I am teaching my church regarding giving. Having been heavily influenced by the likes of Andy Stanley, Randy Alcorn, and my own Dad, I have become convinced that teaching percentage-based giving is not only the number one kind of giving to encourage in our people, but I have also become convinced that the church organization should structure its budget based on the tithes of the people without regard to special offerings, designated funds, or anything above and beyond the tithe. This was posted to YouTube by a lady who had never been to our church before, but came with the violinist. I just finished putting together two new church brochures for our Grand Opening service on Sunday. By the way, if you haven’t heard yet, we are changing our church name to Lafayette Community Church. Read About It Here. I’m uploading both brochures here for your use if you want. In our new church effort in Lafayette, I set as a goal from very early on that we would attempt to do everything we could with excellence, and though we have had some hiccups with our children’s programming and with our music, we have been consistently high quality with our printed materials and with our video presentations thanks to some really great software. On the printed front, we have been using Apple’s Pages for basic word processing and simple page design and Serif PagePlus 11 which is exponentially greater than anything else in its price range ($50 for features that easily surpass Microsoft Publisher and even rival PageMaker or Quark). However, that’s for another blog entry. On to what we do for video now and what our next steps are. Draper Traveller portable projection screen with High Contrast Gray screen material. DLP Projector (I don’t remember the specs right now). ProPresenter is the best program we have found to display lyrics on the screen. It’s very easy to learn with only a few quirks that take getting used to. Together with the Mac, it is unbeatable in terms of visual quality of the text even with full motion high resolution video images in the background. On top of that, the programmers are very responsive to requests for improvements, and the software was designed from the ground up to meet the needs of touring worship bands like Chris Tomlin and David Crowder. Keynote is the hands down winner in presentation software that understands the line between attention-getting and cheesy. Transitions, fades, and slide builds are unmatched in PowerPoint because Keynote does what it does with subtlety. It’s also much easier to work with once you learn a couple of its quirks. Our current setup has us running ProPresenter and Keynote simultaneously on the MacBook Pro. ProPresenter takes over the projector screen and turns it black while waiting for us to begin. Navigation is done on the laptop screen, but lyrics and backgrounds are sent to the secondary display. Just before my message, we hit F1 in ProPresenter to black out the projection screen, switch to Keynote without closing ProPresenter (the projection screen stays black during and after the switch), and hit “Play” on my sermon Keynote file. Keynote takes over the projection screen with my slides and also displays a “Presenter View” on the laptop screen. We turn the laptop to face me, so I can see my current slide and my next slide without ever needing to look over my shoulder. Now that we are meeting in the Long Center (a larger venue), we want to make some changes to our setup so we stay on the excellent side of things. Replace our screen with a larger rear projection screen. We’re looking at the Draper Cinefold and Draper Ultimate series of screens for this. Consider upgrading our projector depending on its performance with the new screen. Most likely, we will just need to buy a new bulb. Purchase a new Mac to put in the sound booth. It needs to have dual external monitor capability, and the only Macs to have that now are Mac Pro computers or Psystar Open Computer Macintosh clones. Split the monitor signal from each monitor out to drive four displays (1). The monitor in the sound booth, (2). the projector on stage, (3) One monitor in front row pointing to stage duplicating what’s on the projector screen. (4) One monitor in front row pointing to the stage duplicating what’s on the screen in the sound booth. That way, the stage-facing monitors will show what’s on the screen and also show the “Presenter View” that Keynote can display. Use VGA cables or a VGA over CAT5e system to get video signal to the stage from the booth. If anyone is reading this post thinking that technology will save your bad presentations, think again. Websites like http://presentationzen.com are a great resource to help you rethink the how and the why of your presentations. Technology can make your presentations more effective, but it isn’t guaranteed to do so. At least 10 minutes a day with God, every day. Time with God means something is read (from the Bible), something is written, and something is prayed. There will be some kind of award given for the person who lasts the longest. I haven’t figured out the prizes yet, but I’m willing to take donations! If you want to sweeten the pot, let me know! I’m also working on setting up some kind of online tool to track our progress and see how we are all doing. For me personally, I’m going to use my blog to record my progress. For 6 weeks, we will be exploring the six biggest questions in life. Why is there such conflict between Science and the Bible? It’s going to be a powerful program combining dynamic Sunday worship experiences with casual but deep discussion groups. I’ve been looking forward to it for 3 months now! 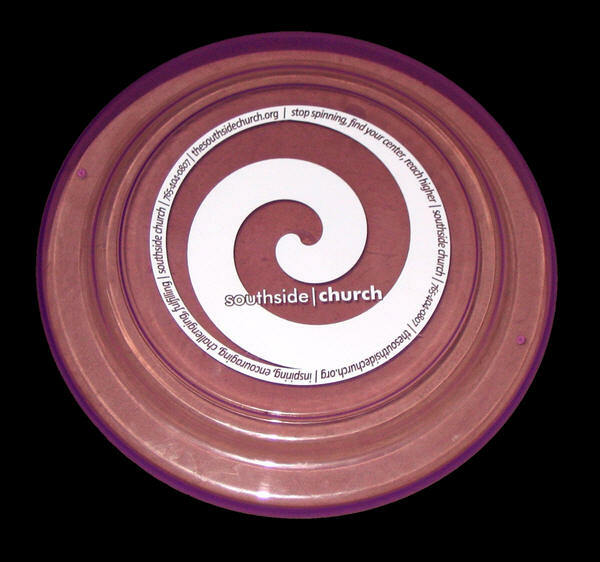 In many ways, I’ve been thinking of this 6 week campaign as a re-launch of the church. During the summer, our attendance went down quite a bit, but now that school is starting up again, I’m really hoping that we can get a jump-start on this new year by launching this campaign. I want every Sunday service to be a real event. More than that, I’m really eager to see us take the life of the church to a new level. Here are my personal dreams for the campaign. That we would get more than 50 people solidly involved in a small group experience. That our Sunday attendance would double. That all our volunteers and campaign directors would be encouraged and excited all the way through. That the campaign would launch us full speed into the Fall. That we’d get a solid small group thing happening combined with memorable Sunday gatherings. These things are so doable, and I believe God can easily accomplish them all. I’m eager to see it! This week we executed a plan that I had been brewing since last year at this time. You may already have read about our “Black Friday” Hot Chocolate Giveaway. On that day, we gave out nearly 500 mugs of hot chocolate or coffee to shoppers braving the local Wal-Mart on the day after Thanksgiving. Well, this week, we gave out flying discs to families at the fireworks show on Purdue’s campus on July 4. It was a blast, and it was a big success too. At the top of this post, you can see the final design for the flying discs that we bought through <www.dollarimprint.com> for around 70 cents each once shipping was included. 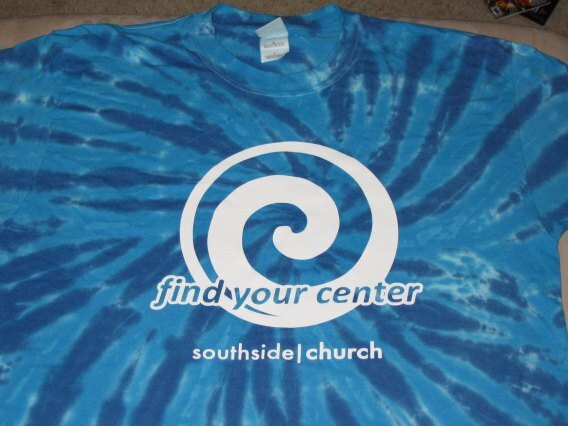 The design on the top is a gradual spiral (which looks really cool when the discs are flying) surrounded by the words “stop spinning, find your center, reach higher | southside church” our phone number, web address, and core value verbs are also printed on the top. 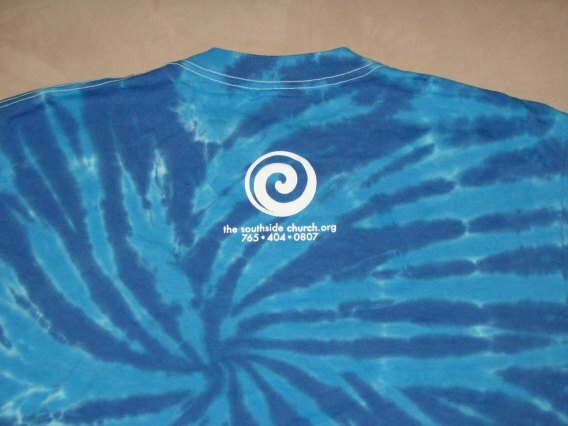 We ordered T-Shirts with a tye dyed look and a very similar logo design on the front and the back. Here’s a picture of what they look like. Give a free flying disc to every family out there until we ran out or it got dark. Have two tables set up to take registrations for a free drawing to win an iPod shuffle or other prizes. Have all our volunteers wearing matching T-Shirts. I should soon have a picture of what the setup looked like. In all, it was a very successful event. The volunteers had a lot of fun, the people who received the flying discs were very appreciative, and a large number of people signed our entry forms. I don’t have a final count yet of those who were willing to be added to our mailing list. It was so cool to look across the field of families waiting for the fireworks to start and to see hundreds of purple flying discs whizzing through the air all over the place. It was really exciting. On top of it all, I personally was able to get in some good conversations with at least 4 different families who were very interested in checking out one of our Sunday Gatherings. Who knows if they will actually make it this week, but I believe we really put our name out into the community in a positive way. I’m really eager to hear more feedback from our volunteers and also from people who may visit our church because of this outreach. If I hear some good things (or criticisms) I’ll post them here. If you would like to chime in with your opinions please add your comment. I want to know what other people think about this kind of outreach. I especially hope that events like these let people in Lafayette know that there is a church around here that cares about them and is willing to invest in their lives in a way that makes their lives a little bit better (and a little more fun too). It’s my passion to see people get a big vision for what God is able and willing to do in our lives. I am convinced that God is bigger and more willing to do more incredible things than we give him credit for, than we expect, and than we are ready for. We just don’t have big enough dreams, but for those who do have big dreams the problem is often that they aren’t ready and willing to put in the effort required to see those dreams come true. Now I don’t have the answer to how to make your dream life come true other than a few simple suggestions I’ve picked up from the story of Joseph, but I do know that whatever your dreams are, if they are God’s dreams, and if you are faithful, they will come true. At the conclusion of this message, I take a few minutes to just dream in front of the congregation about what Southside Church could become. I have big dreams for this church, and I’m pretty convinced they line up with the heart of God for this town. How big are your dreams? Are you ready to work for them? I just want to thank everyone who has been a part of supporting Southside Church. Here’s a little slideshow of our first Sunday. Hope you enjoy it! Today’s message is a message that has been on my heart for a long time, but I didn’t know it until earlier this week. I had come up with the title long ago when we sent in our postcards to be printed, and honestly, I originally thought of the sermon being one about how great the afterlife was going to be. In fact, the whole point of the message originally was going to be that no matter how good this life might get, the really good life is yet to come. It was going to be a message about the Kingdom of God! I still want to do that message someday. I’m not sure when that might happen, and I honestly don’t know if I would be able to preach that message now anyway. I think I need some more life experience, more study or something. Nevertheless, I was praying about this message earlier this week and all at once I realized (it was probably God giving me the thought) that the Bible is filled with “Corner Turning” moments and that God is often the instigator of those corner moments. The whole picture came to me at once that the “better life” I should be talking about is the life that follows God around whatever corner he brings us to! I’m really pleased with how it turned out. Listen up and tell me what you think! The audio can be downloaded by clicking below or subscribing to my podcast or you can watch the video online if you wish. This is the full video of our entire Grand Opening service!